Which Of These 4 Graphics Cards Is The Best? Which of these 4 Graphics Cards is the Best? Sapphire R9 290X 4GB TRI-X vs Sapphire R9 290 VAPOR-X 4GB vs Gigabyte GTX 970 G1 4GB vs Gigabyte GTX 970 XTREME 4GB. Which of these 4 graphics card is the best for 1080p and 1440p? Which of these graphics cards is the most powerful enough to run The Witcher 3, Far Cry 4, Fallout 4, or GTA V at 1080p 60fps and 1440p above 30fps? Which of these graphics cards would you guys buy? BTW I want to upgrade my current graphics card the MSI R9 280X Twin Frozr 3GB. Re: Which Of These 4 Graphics Cards Is The Best? I'm running an EVGA 970GTX and love it. Everything runs smoothly at 1080P for 60+FPS, and 30-40FPS for 4K with some tweaking. I did test a 970 vs 290 in the Witcher 3 and GTA V. Both were pretty even, but the 970 was a little faster by like 2-3FPS, not a huge difference to be honest. 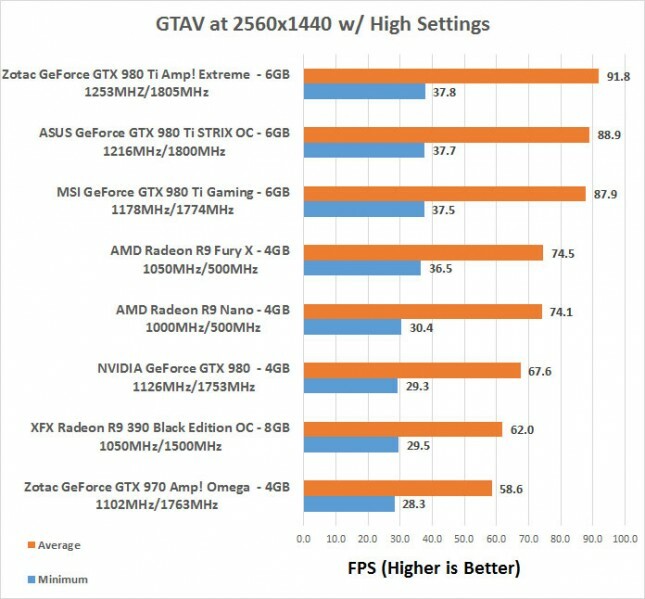 For the most part, either of the cards are going to perform pretty close (with maybe 5FPS difference at stock speeds). You're not going to see a 10+ FPS difference between those cards, unless the game has been specifically optimized for it (ie NVIDIA HairWorks). The biggest difference will come in cooling, power and noise levels; at least from what I've seen. kennyreid95 wrote: Which of these 4 Graphics Cards is the Best? Sapphire R9 290X 4GB TRI-X vs Sapphire R9 290 VAPOR-X 4GB vs Gigabyte GTX 970 G1 4GB vs Gigabyte GTX 970 XTREME 4GB. Which of these 4 graphics card is the best for 1080p and 1440p? Which of these graphics cards is the most powerful enough to run The Witcher 3, Far Cry 4, Fallout 4, or GTA V at 1080p 60fps and 1440p above 30fps? Which of these graphics cards would you guys buy? BTW I want to upgrade my current graphics card the MSI R9 280X Twin Frozr 3GB. 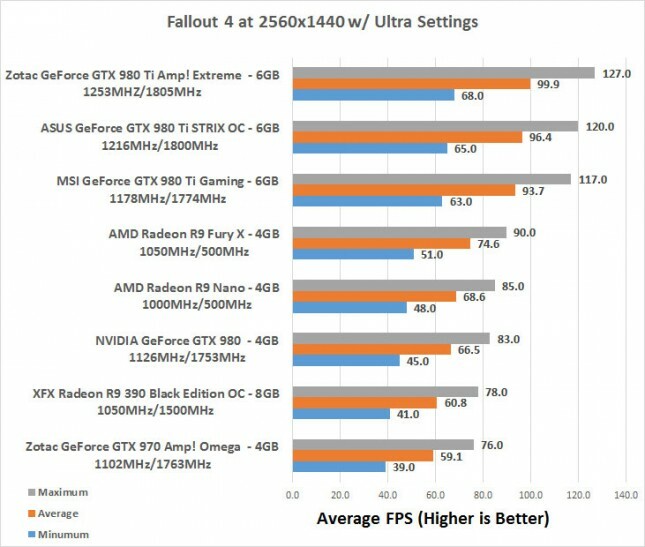 The GeForce GTX 970 will average right around 59-60 FPS on game titles like Fallout 4 and GTA V at 2560x1440 with aggressive image quality settings. An AMD Radeon R9 390 is slightly faster, so a Radeon R9 290 with lower clock speeds and less memory will be slightly slower than a GTX 970. Both are excellent. The G1 Gaming is only very slightly better in my opinion so if you need to upgrade your case then stick with the MSI card. The MSI takes the approach of having a fatter design to deal with heat instead of having three fans. I put the MSI card in a PC I built for a mate to save on price and have no regrets. You wouldn't be able to see the difference in any case so its not worth $80 for a 1FPS difference. I'd say none of them. Get yourself a Gigabyte Radeon Rx480 8Gb. Problem solved!